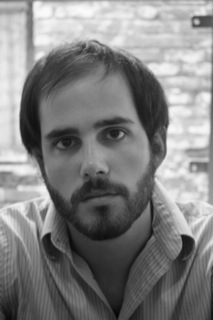 Before Adam Fitzgerald begins his month of January as Poem Of The Week editor on THE THE Poetry Blog, be sure to take another look at the four amazing poets I showcased in December. My aim was to provide a wide range--as much as one can with four people--while remaining within my personal aesthetic. I started the month out with two of my favorite young up-and-coming poets. I was so pleased to begin with the unflaggingly talented Emily Pettit. Her poems are surprising and strange, but what I find so gratifying about them is their interspersed moments of the speaker's bold awareness of self, almost vulnerability. Pettit weaves in and out of a flat direct tone, and soaring lyricalness, they're clean without being neat, and wild without loosing their way. Her debut full length title (greatly anticipated) Goat In The Snow is forthcoming from Birds LLC. Next we have M.A. Vizsolyi, a fellow NYU graduate, whose work has always blown me away with its poignant sensuality, humor and downright original raw talent. It was no surprise that his manuscript The Lamp with Wings: Love Sonnets, won The National Poetry Series. Look for his book this fall. His poems make you want to read them over and over again. The illustrious Sharon Olds was good enough to custom write a poem for the blog with her Ode To The THE. It's a poem of grammatical curiosity and, ultimately, grammatical love. She has a beautiful fascination with the literal written word, and complex preoccupation with language, all rendered here with her poet-god flare and wonderfully strange wit. Keep and eye out for many Olds-odes in the coming year. Next there's the indomitable voice of Mark Bibbins, whose poem begins: "A dead CEO admonishes/ me to do/what I love, which he can’t see me/doing." A fierce and fiery poem that still manages to bathe me in a soft purple glow that only Bibbins could pull-off. I love his line breaks. And finally Matthew Rohrer's [Do you get any reception here?] which I think is a perfect follower for Bibbins' poem. Rohrer poems have such an ease about them that it makes you want to run into the other room and write a poem about running into the other room--which is a poor way of saying I think Rohrer shows us that no subject is to small, no moment too brief--he makes such gorgeous poems with a seeming flick of the wrist. They are indeed "Bits of information like a glorious blanket over the sky." 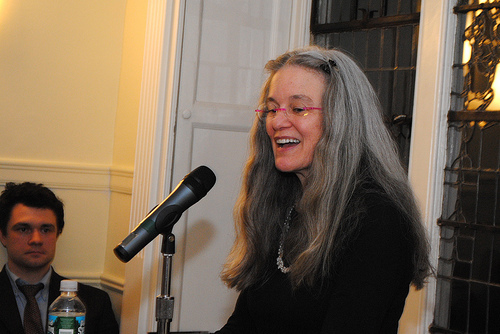 *Photos: Michael Vizolyi; Sharon Olds.